Work in both sections are required to be performed in a live potroom environment, which includes risks of high electrical amperage and work near operating pots containing molten Aluminium. Every individual involved is required to undergo Dubal’s tailor made training courses and pass stringent tests to be qualified to work in live potrooms. A strict “permit to work system” must be complied with. Work involves interfaces with various other contractors working in the same area. Co-ordination is of prime importance as existing resources and work space are to be shared between various activities. 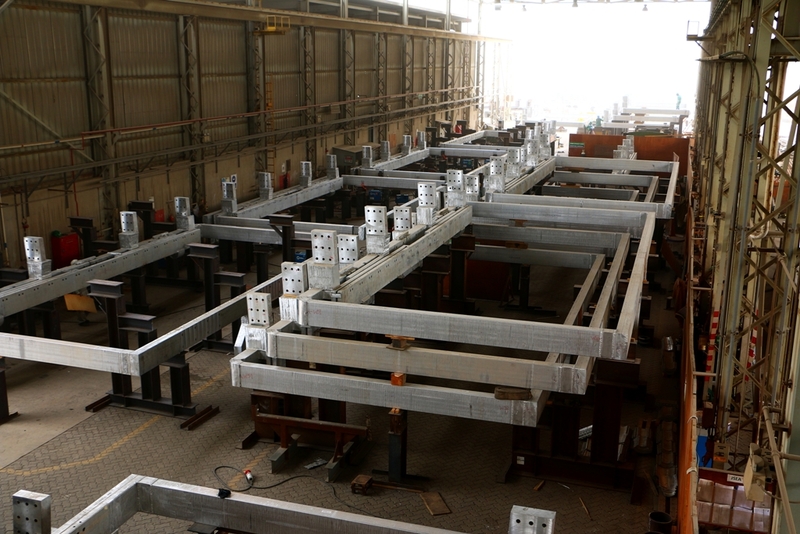 Tight construction schedules have been set by the Client in order to reduce interruptions to existing plant operations and loss of production. The potroom works call for a 24/7 schedule. Potline 8 uses the DX technology which involves high amperage cells. Inside welding is required in order to tie-in the new cells into the existing circuit. This is particularly challenging in view of welding operations to be performed in a magnetic field reaching up to 750 Gauss.